Comet E2 Jacques crossing Cassiopeia as seen from the island of Malta. Credit: Leonard Mercer. Anyhow, here’s a rapid fire run down on what you can expect from three of these binocular comets that continue to grace the twilight skies this Fall. (Note that mentions of comets “passing near” a given object denote conjunctions of less than an angular degree of arc unless otherwise stated). 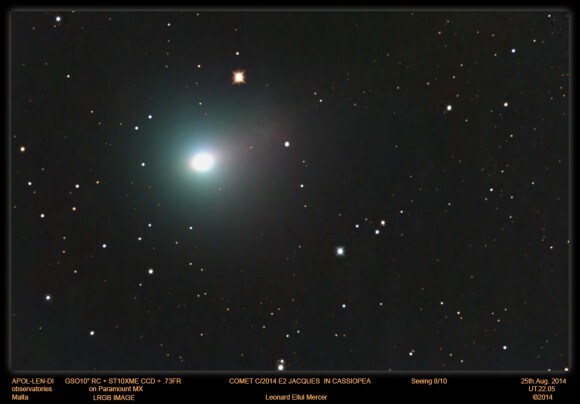 Discovered by amateur astronomer Cristovao Jacques on March 13th of this year from the SONEAR Observatory in Brazil, Comet E2 Jacques has been dazzling observers as it passed 35 degrees from the north celestial pole and posed near several deep sky wonders as it transited the constellation of Cassiopeia. Comet E2 Jacques on August 28th as seen from the MVAS dark sky site in Yellow Springs, Ohio. Credit: John Chumack. Mid-September finds Jacques 55 degrees above the NE horizon at dusk for northern hemisphere viewers in the constellation Cygnus. It then races southward parallel to the galactic equator, keeping in the +7th to +8th magnitude range before dropping down below +10th magnitude in late October. After this current passage through the inner solar system, Comet Jacques will be on a shortened 12,000 year orbit. -Brightest: Mid-August at +6th magnitude. -Perihelion: July 2nd, 2014 (0.66 AU). -Closest to Earth: August 28, 2014 (0.56 AU). Sep 10: Passes the +3.9 magnitude star Eta Cygni. Sep 14: Passes near the famous optical double star Albireo and crosses into the constellation of Vulpecula. Sep 16: Passes in front of the +4.4 magnitude star Alpha Vulpeculae. Sep 20: Crosses the Coathanger asterism. Sep 21: Crosses into the constellation Sagitta. Sep 24: Crosses into Aquila. The celestial path of Comet Jacques from September 12th through November 1st. (All simulations created using Starry Night Education software. Oct 5: Crosses the galactic plane. Oct 14: passes near the +7.5 magnitude open cluster NGC 6755. Oct 15: Drops back below +10th magnitude? Pronounced Ow-KAY-E-Me-dah, (yes, it’s a French name, with a very metal umlaut over the “ï”!) 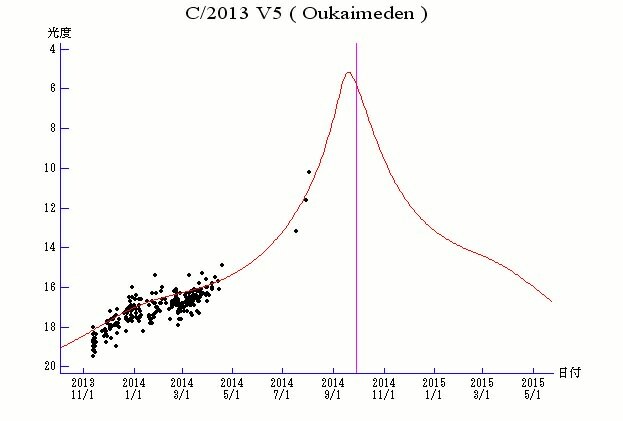 comet C/2013 V5 Oukaïmeden was discovered by the Moroccan Oukaïmeden Sky Survey (MOSS) located in the Atlas Mountains in Morocco. After completing a brief dawn appearance in early September, the comet moves into the dusk sky and starts the month of October located 38 degrees east of the Sun at about 14 degrees above the southwestern horizon as seen from latitude 30 degrees north at sunset. Southern hemisphere observers will continue to have splendid dawn views of the comet through mid-September at its expected peak. Comet Oukaïmeden is currently at +8th magnitude “with a bullet” and is expected to top out +6th magnitude in late September shortly before perihelion and perhaps remain a binocular object as it crosses the constellation Libra in October. An early image of Comet C/2013 V5 Oukaimeden taken in February of this year. Credit: Efrain Morales Rivera. And its also worth noting that as comet A1 Siding Spring (see below) makes a close physical pass by Mars on October 19th, Comet Oukaïmeden makes a close apparent pass by Saturn as seen from our Earthly vantage point the evening before! To be sure, the dusk apparition of Comet Oukaïmeden will be a tough one, but if you can track down these bright guidepost objects listed below, you’ll have a chance at spying it. -Perihelion: September 28th, 2014 (0.63 AU from the Sun). -Closest to Earth: September 16th, 2014 (0.48 AU). Sep 10 through Oct 4: Threads across the borders of the constellations Hydra, Pyxis, Antlia and Centaurus. Sep 18: Passes near the +3.5 magnitude star Xi Hydrae. Sep 19: Passes near the +4.3 magnitude star Beta Hydrae. Sep 25: Passes 1.5 degrees from the +8th magnitude Southern Pinwheel Galaxy M83. Oct 1: Passes in front of the +10.2 globular cluster NGC 5694. The path of Comet Oukaimeden through the month of October: The Sun position is shown for the final date. Oct 3: Passes into Libra. Oct 11: Passes near the +8.5 magnitude globular cluster NGC 5897. Oct 16: Crosses the ecliptic plane northward. Oct 18: Passes less than two degrees from Saturn. Oct 25: Passes less than a degree from the 2 day old Moon and the +3.9 magnitude star Gamma Librae. The projected light curve for Comet Oukaimeden with observational measurements (black dots). Credit: Seiichi Yoshida. This comet was discovered on January 3rd, 2013 from the Siding Spring observatory in Australia, and soon caught the eye of astronomers when it was discovered that it would make a nominal pass just 139,000 kilometres from Mars on October 19th. Comet A1 Siding Spring as seen from NEOWISE early this year. Credit: NASA/JPL. As seen from the Earth, Comet A1 Siding Spring has just broken 10th magnitude and vaults up towards the planet Mars low to the southwest at dusk this Fall for northern hemisphere observers. A1 Siding Spring is expected to top out at +8th magnitude this month before its Mars encounter, and is on a one million year plus orbit. -Closest to Earth: October 28th, 2014 (1.4 AU). Sep 17: Passes into the constellation Telescopium. Sep 20: Passes near the +8.5 magnitude globular NGC 6524. Sep 21: Passes into the constellation Ara. Sep 22: Passes the +3.6 magnitude star Beta Arae. Sep 25: Crosses into Scorpius. Sep 30: Passes the +3 magnitude star Iota Scorpii. Mars and Comet A1 Siding Springs crossing paths through the month of October. Oct 3: Passes near the +7.2 magnitude globular NGC 6441. Oct 5: Passes 2 degrees from Ptolemy’s cluster M7. Oct 8: Passes in front of the Butterfly cluster M6. Oct 10: Crosses the galactic plane. Oct 11: Crosses into Ophiuchus. Oct 19: Passes just 2’ arc minutes from Mars as seen from Earth. Oct 22: Passes north of the ecliptic. Oct 30: Drops back below +10th magnitude? Key moonless windows for evening comet viewing as reckoned from when the Moon wanes from Full to New are: September 9th to September 24th and October 8th to the 23rd. 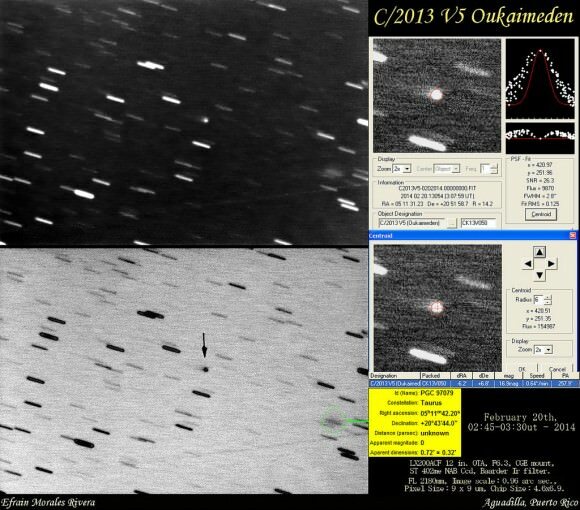 Looking for resources to find out just what these comets and others are up to? The COBS Comet Observers database is a great resource for recent observations, as is Seiichi Yoshida’s Weekly Comet page. For history and current info, Gary Kronk’s Cometography is also a great treasure trove to delve into, as are the Yahoo! Comet and Comet Observer mailing lists. Be sure to check out these fine icy visitors to the inner solar system coming to a sky near you. We fully expect to see more outstanding images of these comets and more filling up the Universe Today Flickr forum!